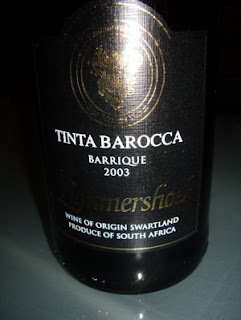 The Lammershoek Tinta Barocca barrique 2003 comes from Swartland, north of Cape Town. As the magnificent wine producer Allesverloren, Lammershoek has used the tinta barocca grape to produce a rich and full bodied red wine. Made from 100% tinta barocca grapes, I still did not think it reached the level of the similar wine by Allesverloren. Still Lammershoek Tinta Barocca 2003 is for the mature wine lover. Deep red colour with a very complex character. A wide variety of different aromas as plums, red berries, earth, chocolate, pepper and minerals are all on your pallet. This is a wine you may enjoy with game, red meat, and rich stews, or you may sit in the dusk in your living room, watching a crime novel on your television and sip a glass of Lammershoek Tinta Barocca Barrique 2003.